In addition to being a role model for individuals struggling with self-image issues and serious disorders like bulimia, Demi Lovato has devoted significant time and energy to speaking out against bullying as well. Having been a victim of intense verbal harassment in her younger years – which actually resulted in her leaving middle school – Demi is now helping boys, girls, men and women of all ages deal with bullying in a positive way. 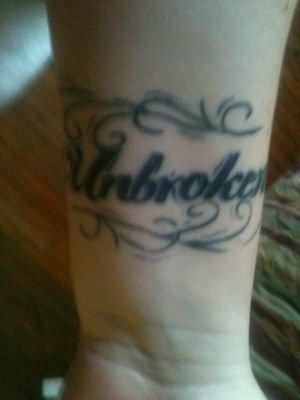 The 20-year-old singer has inspired more than just the strength to stand up against bullying though; Demi Lovato fans from all over have shown just how much Demi has helped them by getting pretty awesome tattoos that are obviously inspired by the singer, but also have a deep personal meaning for the wearers. The newest season of The X Factor premiered on September 12, and we all got to see exactly why Demi Lovato was chosen as a judge on the show – because she relates to the contestants in a way that few other people can. One contestant in particular – 19-year-old bullying victim Jillian Jensen – struck a chord with the singer, as Demi whispered “You can feel that pain” to Britney Spears during the girl’s rendition of Jessie J’s “Who You Are.” Following her performance, Jensen revealed that she too had a “Stay Strong” tattoo, similar to Demi Lovato’s. It seems like young men and women across around the world draw inspiration from Demi’s troubles and triumphs, and many of them have even gotten tattoos dedicated to the 20-year-old star inked on their bodies. 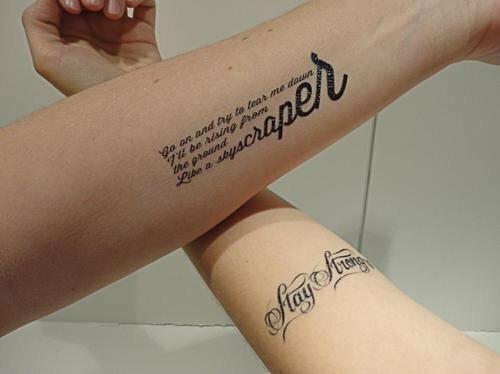 When it comes to fan tattoos inspired by Demi Lovato, many people have duplicated the singer’s “Stay Strong” tattoos inked on her wrists, while others have found strength in the singer’s inspirational lyrics. This one fan in particular opted for both. On this girl’s left wrist, she has a large red heart tattoo surrounded by the words “Stay Strong,” inked in a scrolling black script and a small heart, similar to Demi’s wrist tattoos. 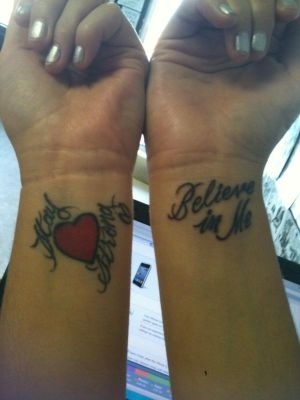 On her right wrist, the Demi fan has another tattoo featuring the words “Believe in Me” inked in a more simple font. “Believe in Me” is the title of one of Demi Lovato’s songs from her debut album, Don’t Forget. The track includes the following lines: “I’m losing myself tryin’ to compete / With everyone else instead of just being me,” and “I’m gonna wake up feeling beautiful today / And know that I’m okay.” It’s easy to see how these lyrics could inspire a victim of bullying to get a permanent reminder inked on their body. Another person facing struggles of their own turned to Demi Lovato for inspiration and ended up getting a “Skyscaper” tattoo inked on their arm. “Skyscraper” is one of Demi’s most popular songs, and was featured on the singer’s third studio album, titled Unbroken. This fan’s arm tattoo reads, “Go on and try to tear me down / I’ll be rising from / the ground / Like a skyscraper.” These particular song lyrics describe an individual rising above hardships inflicted by others (bullies) to become a stronger and more confident person. It’s fitting that fans of the 20-year-old singer have gotten tattoos of her song lyrics that have helped them through tough times, since Demi Lovato’s own “you make me beautiful” ribs tattoo was inspired by Bethany Dillon’s song, “Beautiful.” The Demi Lovato fan in this photo is posing with another person who has a “Stay Strong” tattoo.